Throughout its fifty-nine years, the Art, Design & Architecture Museum (AD&A Museum) at the University of California, Santa Barbara, has built a national reputation around its dynamic program of changing exhibitions and thoughtful use of its permanent collections. In a serene setting alongside a Pacific lagoon, the AD&A Museum provides intimate access to paintings, works on paper, sculptures and decorative objects in a diverse collection, known especially for its Architecture and Design Collection. The Art, Design & Architecture Museum began in 1959 as an “Art Gallery” within the art department at the University of California, Santa Barbara. Early exhibitions focused on the work of students and faculty as well as the display of local collections. In 1961, UC Santa Barbara faculty member and prominent architectural historian David Gebhard (1927-1996) was named as the first Director of The Art Gallery. Two years later, in an announcement for Fall-Winter 1963-64 exhibitions, reference is made to the display of selections from the “permanent collection.” The earliest acquisition, a group of paintings and works on paper by Santa Barbara-based artist Fernand Lungren, dates from 1959. From its inception, The Art Gallery acquired works intended to be shown on a permanent basis in support of the University’s goals of education, research, and service. Comprising more than a half-century of acquisitions, the genesis of the AD&A Museum collections dates back to 1959 with the bequest of The Fernand Lungren Collection, a group of over three hundred paintings and drawings by Santa Barbara-based Lundgren which convey the stark beauty of the American West at the turn of the twentieth century. The Sedgwick Collection of Old Master Paintings, twenty canvases by French, Italian, Dutch, Flemish and German artists of the fifteenth to seventeenth centuries, followed in 1960. A collection of twentieth century and Old Master prints from Margaret Mallory comprised the AD&A Museum’s third acquisition in 1961 and a collection of Pre-Columbian objects donated by Mrs. MacKinley Helm followed in 1963. Over the decades, such acquisitions gradually formed the basis of two substantial collections: works of art (over 8,500) and architectural drawings and design-related materials (over 1,000,000 drawings and 250 archival collections). In 1973, The Art Galleries—which had expanded to comprise four exhibition spaces, including the Main Gallery, West Gallery, South Gallery and Walkway Gallery as well as numerous loans of works of art displayed in buildings throughout the UC Santa Barbara campus—received accreditation from the Association of American Museums. The newly accredited museum became a separate department within the College of Letters and Sciences in 1973, with the Director reporting to the College Provost, although the museum itself retained the name The Art Galleries. In April 1977, the name was officially changed to the University Art Museum in exhibition catalogs, announcements and correspondence. Thus, the February 2012 reopening of the museum following a seismic retrofit marks the 25th anniversary of our public designation as a museum, providing a fitting occasion for the museum’s new incarnation as the Art, Design & Architecture Museum. The AD&A Museum is located on the University of California, Santa Barbara campus in a set of galleries that were remodeled in 2000 by noted architect Brenda Levin. Ms. Levin is recognized for her renovation and adaptive re-use of cultural and educational buildings, including work at The Huntington Museum, Occidental College, and Scripps College. 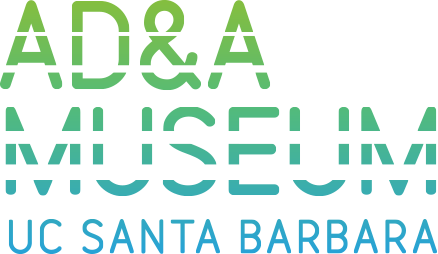 Over the last 25 years, the AD&A Museum has benefitted from the directorship of skilled and dedicated professionals from within and outside the UC Santa Barbara community. Following David Gebhard’s twenty years of service, the museum was directed by J. David Farmer (1982-89), Herbert Cole (Professor of Art History and Acting Director, 1989-91), Marla Berns (1991-2001), Chris Coates (Acting Director, 2001), Bonnie Kelm (2002-2005), Ann Bermingham (Professor of Art History and Acting Director, 2005), Kathryn Kanjo (2006-2010), and Bruce Robertson (Professor of Art History and Director, 2010- ). In addition to his two decades of stewardship as Director of the museum from 1961-1981, David Gebhard established the museum’s Architecture and Design Collection (ADC) in 1963, which has grown to become one of the largest and finest architecture and design archives in North America. The collection documents the heritage of Southern California-based designers, architects and planners. By 1969, a number of internationally significant collections had been acquired including the design archives of R.M. Schindler and Irving J. Gill. In 1981, the ADC became a special unit of the Museum with its own curator (appointed as a full time staff member in 1997). The ADC remains the jewel in the crown of the AD&A Museum holdings and is essential for studying the built environment of Southern California from the late 19th- through the mid-20th centuries. Of considerable breadth for a museum of its size, the AD&A Museum’s Fine Arts Collection includes the Morgenroth Collection of Renaissance Medals and Plaquettes, the Sedgwick Collection of Old Master Paintings, the Feitelson Collection of Old Master Drawings, the Ken Trevey Collection of American Realist Prints, the Fernand Lungren Collection, and a growing collection of contemporary artwork in all media. Contemporary holdings focus on artists active in California, particularly in the Santa Barbara community. The AD&A Museum also features significant holdings in photography, including an extensive collection of vintage daguerreotypes, tintypes and ambrotypes from 1840-1880 as well as works by Muybridge, Weegee, William Wegman, Gary Winogrand, and Carrie Mae Weems. In addition, the art collection is strong in ethnographic objects. The earliest exhibition at the “Art Gallery” of UC Santa Barbara displayed the work of German painter Max Beckmann, September 16-October 6, 1959. Throughout the next five decades, the AD&A Museum offered exhibitions encompassing both the thoughtful use of the museum’s permanent collection as well as selected works from notable regional collections, both private and institutional. A chronological archive of all AD&A Museum exhibitions over the past fifty-eight years is available with highlights listed below. The AD&A Museum reopened on February 26, 2012 following an extended closure for seismic retrofit and remodeling. The inaugural exhibition in our improved facility was Carefree California: Cliff May and the Romance of the Ranch House, which was the major architecturally-focused exhibition of Pacific Standard Time: Art in LA, 1945–1980, an unprecedented regional collaborative arts initiative supported by the Getty Foundation. Carefree California was one of more than 60 exhibitions across Southern California that told the story of post-World War II art and culture in Los Angeles. This exhibition utilized the strength of the ADC’s holdings to develop cross-disciplinary programming and community collaborations in fostering meaningful scholarship and welcoming new audiences from Southern California and beyond.